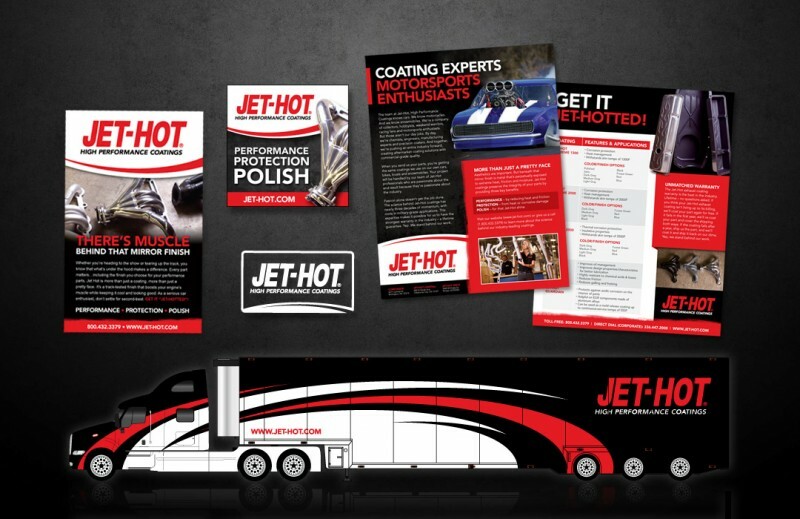 Print collateral design pieces from print ads to a hauler wrap design for Burlington, NC based high performance coatings company, Jet-Hot. The Jet-Hot brand can be found anywhere from the showroom at the SEMA Show in Vegas to the ZMAX dragway in Charlotte, NC. Ad concepts were developed for Jet-Hot that were featured in the “Dukes of Hazzard” edition of HOTROD Magazine. Jet-Hot, High Performance Coatings provides coating solutions for aftermarket and commercial applications. With a national dealer network and production facilities in North Carolina, Oklahoma and Arizona, they are uniquely situated in the coating industry to deliver consistent and efficient service to both aftermarket, commercial and motorsport customers across the United States and beyond.